Fashion Herald: Aeropostale's Teens For Jeans is Back! Aeropostale's Teens For Jeans is Back! Teens for Jeans kicked off today, so donate your denim at any Aéropostale or P.S. from Aéropostale store from January 12 - February 15. Over a million young people experience homelessness in the US every year. One item they often request? A pair of jeans. Drop off a gently-used pair of yours soon, and/or help by signing your school up for Teens for Jeans. 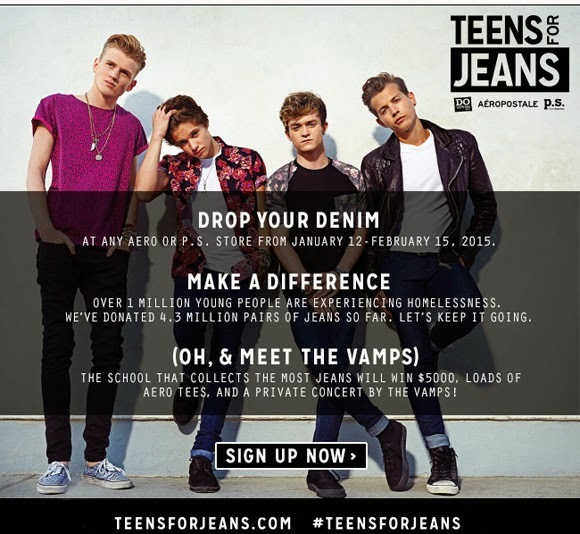 The school that collects the most jeans wins $5,000, Aero tees, and a private concert by The Vamps!